Ethan’s strength continues to amaze us. He has survived and is healing despite the expectations of all of his doctors. It doesn’t make sense medically. One of his doctors believed that if he were to be intubated he wouldn’t survive more than a day because of the extra trauma to his compromised trachea. Ethan has been intubated 3 times since then because problems with securing the respiration tube. The medication that was needed to reduce swelling in his airway, over stressed Ethan’s heart and was causing his heart rate to dip so low that if he didn’t have EB they would have performed CPR on him. The doctors were not sure what was causing his heart to dip and told us they would call us when it was happening again so he could pass away in the comfort of our arms. They also stopped the steroid treatments for the swelling and cut his pain medication in half. To every ones surprise his heart has been at a normal rate for a few days now. His nurses are filled with Joy, at the start of shift, to find out that he is still living and has recovered from the state they last saw him in. Ethan was only to be placed on the G-tube procedure waiting list if he could reach a point of recovery in which he could be extubated, rendered unlikely by a few of his doctors. To our amazement Ethan reached that point on Thursday the 5th. He was due to receive the G-tube procedure on Friday but was plagued with infections. In the last three days Ethan has had 3 different types of infection with fevers that exceed 104°F. 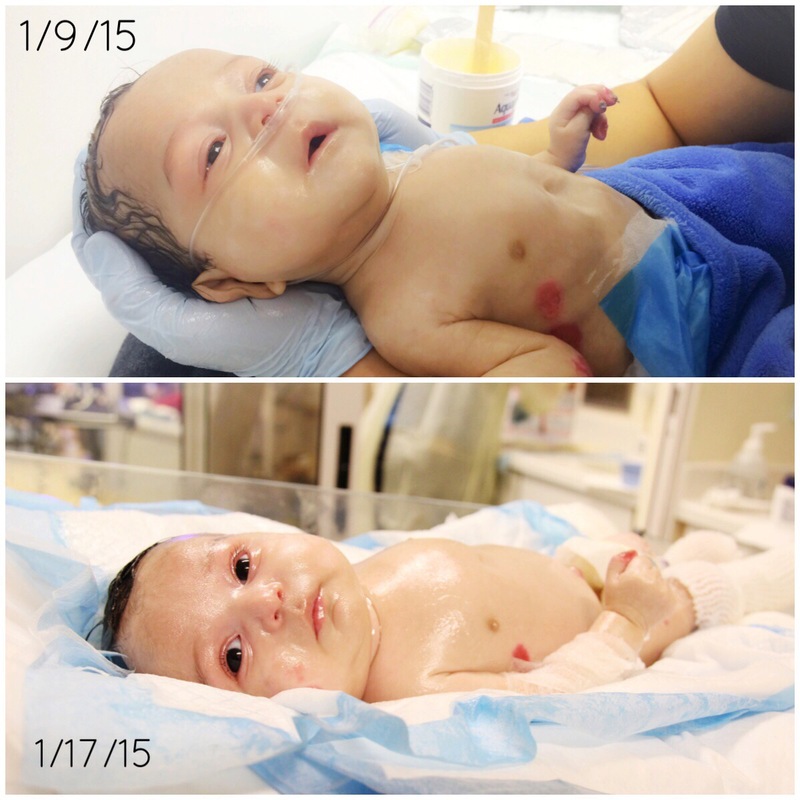 Ethan has 3 tubes leading into his body that are all at risk for causing infection. Assuming that we are able to get the infections under control we hope to get the G-tube procedure done soon so we can remove his breathing tube. Prolonged intubation with a low dose of sedation lowers the probability that extubation will be even possible. The longer the breathing tube is in, the more area may get broken down in Ethan’s throat. Ethan’s skin and airway are healing very nicely though, because of all the extra energy Ethan has now that he is not working hard to breath. The situation is very complex but Ethan keeps us reevaluating the meaning of strength. His admirable strength is the greatest I have ever seen with my own eyes. I would have passed away with less than half of what he has endured. He has made people who are conditioned to be emotionally strong, break down in tears. How has he broken nurses, doctors and us? By having us be witnesses to the remarkable strength the Lord continues to bless him with. Ethan is awake for hours because he doesn’t share the same level of comfort of you and I but he doesn’t complain. His gauze changes hurt, especially his right leg, his heart rate races over 200, sometimes he turns red but he doesn’t cry or throw fits anymore. And in all of the chaos we have times of true peace and we thank God for never leaving Ethan’s side. We have all fallen short of deserving God’s mercy on our loved ones. With all the suffering in the world in perspective, I hope you take the time to thank God for choosing you to have such a blessed and abundant life. My father always said, “there is a different world for every set of eyes” and we all believe that what we perceive is true way to interpret the world, but we are all wrong. We can only achieve higher levels of understanding when we except that our interpretation of the world is not entirely correct. If we open our mind and our heart we can find the answers that we desperately need to fulfill our purpose. Where we see death the Lord sees life. Thank the Lord for having this life changing experience fall onto our shoulders… Jesus, if the rest of our lives we are to struggle to be pillars of foundation for your light house, we thank you for giving us the strength to endure the test of time and for distributing the weight among all of Ethan’s supporters. The Glory be to God in the Highest Heaven. God bless baby ethan. I admire you for staying strong. May God always bless you and you little angels. I know baby Ethan will be fine inthr name of Jesus🙏 amen! May god continue to bless your little angel with that strength to pull out of all this, may he stay by his side healing him more everyday. His a true blessing and he fills up my heart with sweet tender love for beeing such fighter i believe we can all learn alot from this little fellow…. You guys are doing great beeing so strong for him may god bless you all cant wait for the next update !!!!! God Bless baby Ethan! He is a true miracle, and I know that our Heavenly Father will never abandon him or your family. He is such a beautiful baby and oh so strong. He is so stron and beautiful…Please know we are praying for you all. God Bless! A friend posted about ethans story on instagram. I immediately started trying to see what she was talking about. I have a 9 month old daughter and as a mother i broke down reading ethans story. Your family and ethan are so strong and the lord has such greater plans for yall. Yall will find the answer to all yalls pain soon enough. The lord loves that little man. And me and my family will pray every night for ethans health. We love yall. God bless your baby Boy… am sooi inspired by your strength. . You have a beautiful family. . Ill keep baby Ethan in my prayers. . Much respect . We must always trust in the lord with all our hearts! Ethan is a fighter he’s changed the lives of my family he truly is wonderful n strong my three year old serenity fate always talks about him and how he’s the strongest boy in the world n he’s a hero in her eyes I read her your blog n show her all the instagram post n she’s simply amazed with him n his miracle battle she prays for him n your family she wanted me to write to yuu n tell yuu to read proverbs 3:5,6 her favorite scripture she also says to sing him twinkle twinkle little star when you can! I am reading this and I cannot stop crying. Your faith is unbelievable as I at times doubt everything in a time of crisis. You have one of the most beautiful beautiful little boys I have ever seen. I will for the rest of my life remember your son Ethan & I will pray for all of you. I wish there was something I could do or say but I’m lost for words. God bless that handsome baby boy and may he have better days. Please give him a lot of kisses from me as I love him and don’t even know him. All my prayers to baby Ethan. 💙 stay strong mommy every thing will be better he is such a strong little boy and will fight trew all this. 👣😇 he’s such a cutie. And your such a strong mommy . all my prayed go to u and your family. Reblogged this on The Diary of a Mommy. thank you, Norma, for taking the time to write this. I have done as you have asked; I’ve thanked my Heavenly Father for my blessed life and I’m encouraged by Ethan’s strength. God chose wonderful parents for Ethan.